Are you guilty of not wearing sunscreen on your face daily? Besides adding an extra skincare step, it can be annoying to put a greasy sunscreen on when it’s hot. And of course it may not work well with makeup. 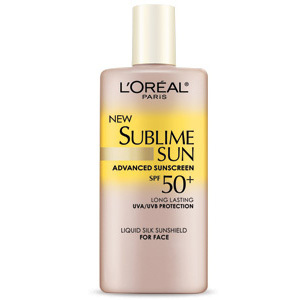 We tried L’Oreal Sublime Sun Advanced Sunscreen SPF 50+ Liquid Silk Sunshield For Face and were surprised by how lightweight it was – it felt more like a normal moisturizer and even contains Vitamin E and White Grapeseed. 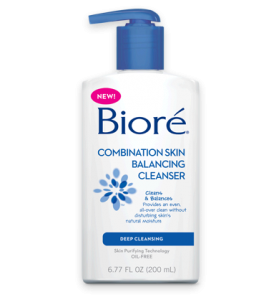 It’s not too heavy and absorbs quickly – a must for those with oily skin. We think this is a great product to try if you’re trying to do better with wearing sunscreen every day, and since it’s water resistant you can also use it for the beach. If you have oily skin you can use this instead of moisturizer, but if you have dry skin this won’t be enough to use alone. Tip: After you’re done applying sunscreen on your face, be sure to do a swipe on your ears and behind them. There are many skin cancer cases in the ear area, so be sure to cover up! Hairsprays that don’t leave your hair stiff aren’t as hard to find as they used to be. We tried L’Oreal’s Studio Line Mega Hairspray which promises to give hold and shine. It definitely worked well and gave touchable hold. However, the scent was fairly strong and lingered throughout the day. So if you’re not into heavy fragrance in hair products it may not be for you. Red lipstick is definitely in! We saw the Beyonce’s ad for L’Oreal Colour Riche Lipcolour in No° 315 and decided to give it a try. On the ad, the color looks like more of a brick red, but in person it’s more of a vibrant coral red. It’s very bright (although it looks subtle in the ad) so this shade is not for the faint of heart! What we liked the most about this lipstick is that it’s pigment rich without drying. If you wear true lipsticks then you know that can be a huge drawback. The Colour Riche formula contains Omega3, Vitamin E, and Argan Oil which are all moisturizing ingredients. This lipstick will kiss off and leave marks on drinking glasses, but since the pigment is so great it fades away beautifully. To see other L’Oreal products we’ve tried click here.